Mr. Simons does what I like to refer as fashion art. We know he has an admiration for futuristic androgynous type silhouettes (his cartoon boots were it), but everything he produces is always meant to be wearable. 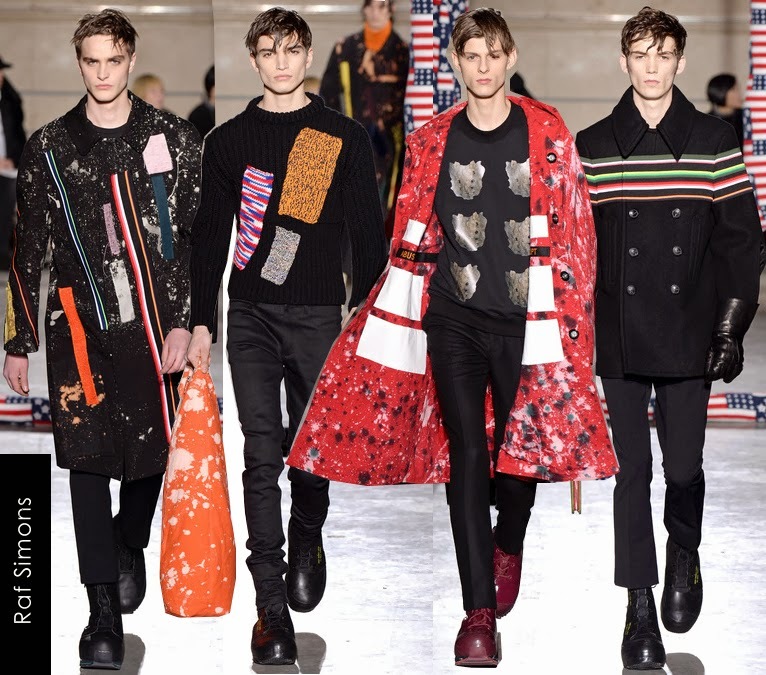 And that’s the magic of a Raf Simons show. Submerging one into another dimension where clothes have a life of its own. No ordinary wool coat or suit, but hours of superb surrealism like the one he sent out in his new presentation. For his fall 2014 collection, he collaborated with artist, Sterling Ruby, and presented one of his strongest art theme collections to date in my opinion. He took a break from suits, and instead opted to inject living art colors in outerwear that sometimes came etched with slogans, patches of fabric, and his signature graphic images – planets, glossy manicures, shark jaws, and other mien sketches. Oversized coats and knits were treated as canvases an artist would paint, craft, or in some cases splash and bleach paint over shirts and pants to make them look even more desirable; pleasing too were his insets of camouflage and camel trench coats shown at end. They were contemporary art pieces that were luxuriously made to feel like one of a kind, which in the art world would make perfect sense. You want to create something that opens an emotion between mind and reality. And that seemed to be Mr. Simons’ and Mr. Ruby’s collaboration between fashion and art: nothing is as simple as it may appear. And it is obvious Mr. Simons has an exquisite taste for art, but even more obvious that he never thinks about marketing. Marketable could have been his rainbow striped coats, graphic sweaters, and skinny tailored pants that probably will be available next season. But the designer has already stated the rest will probably stay with him, because most of these clothes (handmade) will actually be complicated to reproduce again. And I understand now his "Father" slogans. It was a personal masterpiece reward, where you have to agree this talented designer has a risky – and savvy – imagination other designers can’t dare to do. The need for money doesn’t seem to be his number one priority to create his creatures. Meanwhile, Hedi Slimane of Saint Laurent has been turning his rock inspired looks into highly marketable clothes anyone could wear. Mr. Slimane absolutely knows how to do business, but he also knows how to design sumptuous clothes men of all ages and personalities could share through his own personal devotions – rock, leather, and black. He shocked most of the fashion world when he became the new creative director for the house, but he has now found a niche – making the classics the modern rebel – that plays homage to the late YSL. There’s no disrespect in what Mr. Slimane is doing for the brand, but a benefit to globalize as much rapidly as it can. 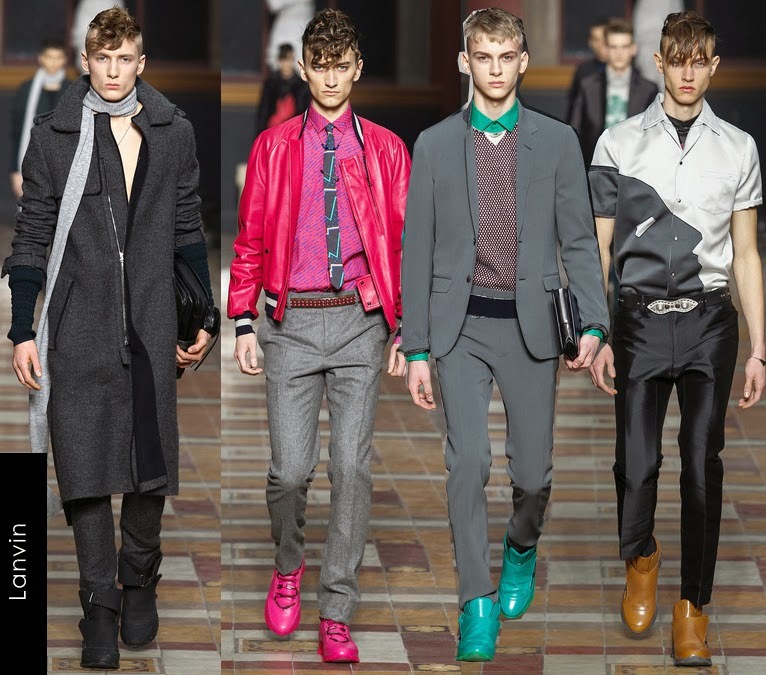 50s seemed to be his inspiration to these less grungy more Teddy boy looks that lifted the mood of the new fall 2014 men’s wear collection. And even though he still casted his slim hunchback models to wear his clothes, these pieces proved to have power out of the runway. Mr. Slimane proposed more than enough luxury outerwear to lust for next season: gorgeous coats in tweed, leopard, houndstooth mohair, and a lustrous silvery furry creature that was breathtaking at the beginning of the show; signature motor and varsity jackets upgraded to leopard prints and studs; and marvelous slim-fitted trenches. 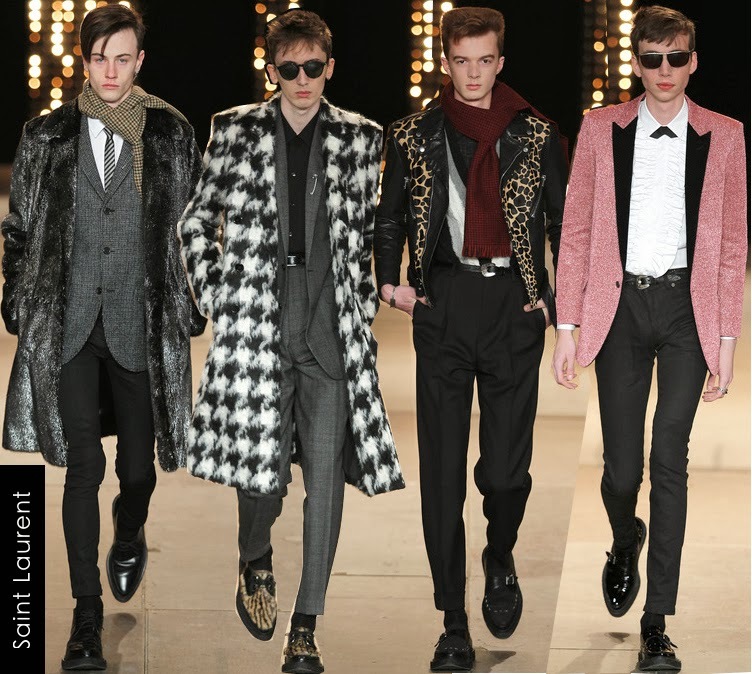 For suits, he mixed his Teddy boy influence with Saint Laurent’s proportions (relaxed suit jackets done in a squared-shoulder line) to give them a more modern-retro feel. That included sequined stripes, metallic checks, embroidered silver-y strings, and others in pink and green lurex worn with skinny denim or leather pants. But he also thought about his more tailored fitted customers who’d want a little dose of Teddy cool in a studded leather suit or printed leather. Overall, these clothes were much more enticing – youthful, polished, and simply cool to say the least. It showed Mr. Slimane is also another intelligent man who clearly doesn’t seem to care about jealousy. His job is to market to the rich. And while critics may still try to crush him, clothes on the other hand speak for themselves. I’m not a rock fanatic, but these clothes have options to fit into my own personal style when broken down. I can bet cash registers will still be ringing $2,000+ coats come next season. Saint Laurent is here to stay whether you like it or not. Another show worth talking about is Lanvin. Cool trendy sneakers have been the trademark of the brand for quite a while, but I am sure this won’t be the only thing Lanvin will be known for anymore. 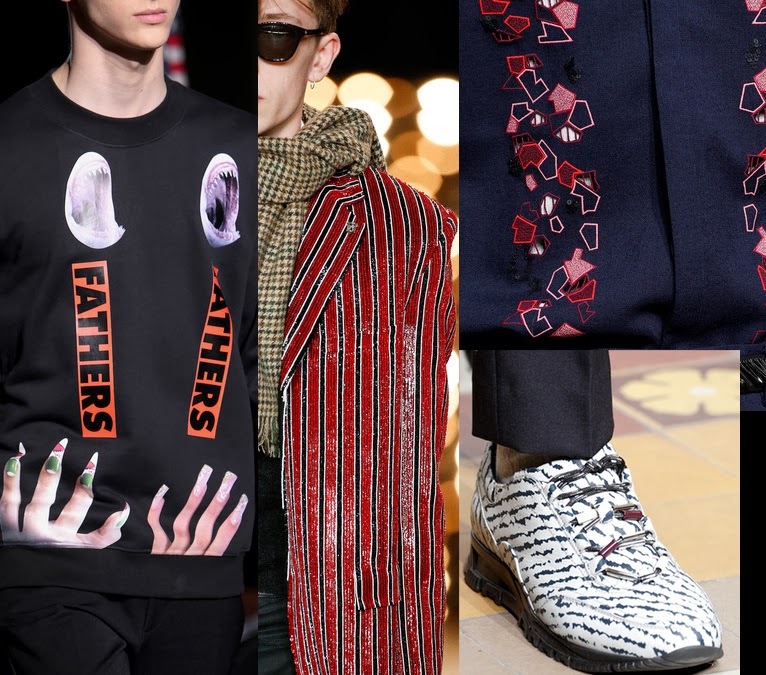 Over the past few seasons, designers, Alber Elbaz and Lucas Ossendrijver, have been working diligently to give the Lanvin man an identity. Now, there seems to be a compelling signature beginning to develop. They’re taking couture fabrics and street style to make quirky and sophisticated collections that’s impossible to resist. And being awkward is nothing to be ashamed of for Lanvin. It runs in the label, and they use it to their advantage in exciting manners. This collection in particular demonstrated to have a great sense of proportion and confidence: relaxed trompe de l'oeil coats that popped when worn with oversized scarves and no shirts; high-tech jackets and knits embossed with patches of fur and leather that were worn with cool mesh, leather and patterned shirts – appliqué confetti’s, funny prints of faces and hands, and more; nicely tailored suits – in forest green, plum, and sand – paired with unique, colored side-strapped pants; and fluorescent sneakers to complete the street style look. A favorite of mine here was a fluorescent pink bomber jacket that paraded with confidence. If Lanvin keeps moving in this direction, they might as well become a threat to other brands, because they’re making innocent clothes that are convincing to wear and collect - fresh and luxurious. This might be why Paris is the city of lights. The stars shine better here.